One good thing about living in the city– no one nags you about your lawn. In fact, I don’t have one. 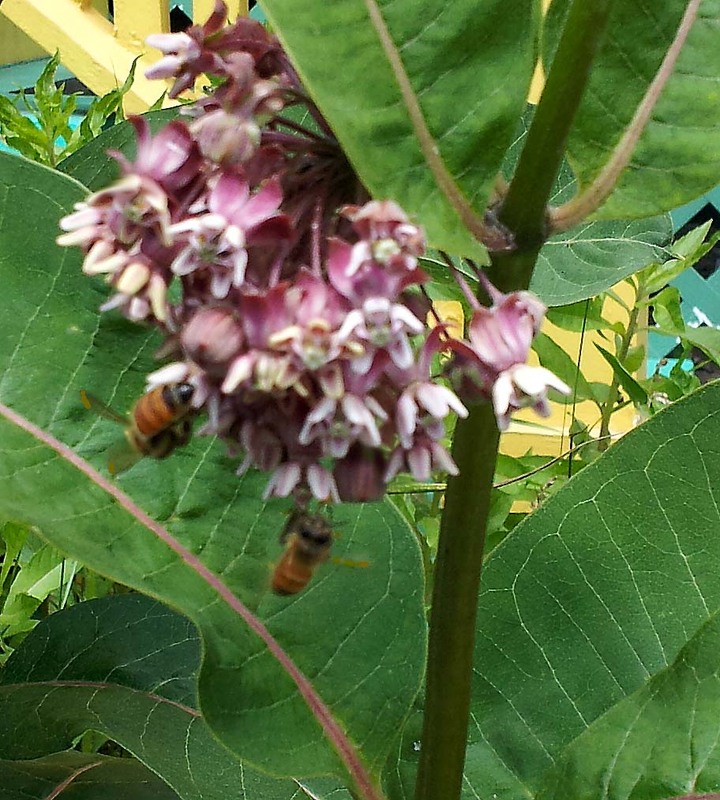 Instead I have a butterfly garden, with sweet-smelling milkweeds just coming into bloom. Chemicals from the milkweed plant make the monarch caterpillar’s flesh distasteful to most predators. Monarch butterflies are specific to milkweed plants; this is the only type of plant on which the eggs are laid and the larvae will feed and matures into a chrysalis. Eggs are laid on the underside of young, healthy leaves. Monarch, Queen, and Viceroy butterflies are Müllerian mimics; all are toxic, and have co-evolved similar warning patterns to avoid predation. Milkweed species are attractive to many insect species, including the large milkweed bug, common milkweed bug, red milkweed beetle, blue milkweed beetle, and bees. Accordingly, this is a wonderful horticultural plant for landscaping to attract butterflies (particularly monarchs), whose numbers are declining and migratory routes changing due to lack of appropriate habitat. It’s amazing how close to nature you can get when you don’t go overboard with the mowing. How very informative. Thank you! That is one of the prime reasons I chose to live in a dense urban environment as opposed to the spread out suburbs: no lawns to mow. yeah, I like the dense and urban too. you never have to walk very far to get to the next coffee oasis. Or groceries, or goodies, entertainment, etc. I love the urban environment. And this weekend I’ll be in my absolute favorite urban place, New York City!